US-trained Filipino chef Fernan Punzalan, together with his two business partners, put up Creative Group, Inc., which owns and operates Serenade Hall in Makati Central Business District area. FATS FACTS. Consuming too much food items with trans fats, such as French fries, fried chicken, and potato chips, has been found to increase the risk of coronary artery diseases, according to health experts. What differentiates Serenade Hall from other restaurants is its classy cafeteria concept where they serve 16 affordable and varying dishes every day. Its core dishes consist of Filipino delicacies cooked differently. The restaurant, where Chef Fernan is the corporate chef, strives not to use trans fats, which have been found to increase the risk of developing heart diseases. “There is a conscious effort not to use trans fats in our own little way. For example, in our coffee, we offer fresh milk instead of powdered creamer alone. For cooking oil, we try to use Minola since this is made from coconut oil. And we have a fryer that can separate trans fats during frying. The technology was from Korea; it’s called water fryer,” explained Chef Fernan. However, Chef Fernan revealed that while they offer alternative healthy options, they are a bit more expensive than their regular meals, and sometimes overlooked because some customers are not aware of their health benefits. “We always offer them (customers) organic chicken binakol and our black/red rice. But in the end, it’s always their choice,” he said. Of 16 individuals asked in a random survey, 10 are aware of ‘trans fats,’ while the rest aren’t. The respondents consist of eight males and eight females with ages ranging from 23 to 58 years old. When buying food, 13 respondents usually look for the health benefits and food taste, 12 for affordability and food preparation, eight for ambiance, location/convenience, and six for customer service. 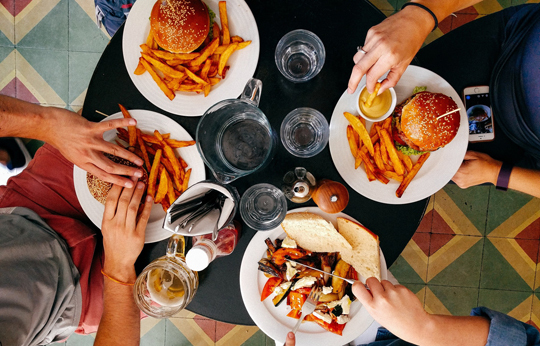 While majority look for health benefits in the food they eat, 12 admitted to eating French fries once a month, three for twice a month, 11 admitted to eating cakes once a month, seven eat doughnuts, and one does not eat any of the food mentioned. The survey also looked into the body mass index (BMI) of respondents, seven have normal BMIs, six are overweight, and three are considered obese. Only 10 of the respondents are engaged in physical activities such as running, swimming, basketball, walking, road cycling, jogging, and many more. Six of them have medical conditions (e.g. hypertension and high cholesterol) and are currently taking maintenance medicines. Trans fats are partially hydrogenated or trans fats created through an industrial process where hydrogen atoms are added to liquid vegetable oils. They are more solid than oil, making them less likely to spoil. Trans fats help food to have a less greasy feel. “Trans fats are edible, consuming trans fats has been shown to increase the risk of coronary artery disease in part by raising levels of low-density lipoprotein (LDL) often termed as ‘bad’ cholesterol,” explained Dr. Anthony Leachon, a cardiologist and a preventive health education and health reform advocate. Worldwide, cardiovascular diseases (CVDs) are the world’s biggest killers. One-third, or 31 percent, of deaths worldwide are due to CVDs, resulting in about 17.7 million deaths every year. Some of the foods with trans fats include French fries, margarine, fried chicken, non-dairy creamers, microwave popcorn, frozen dinners, pie and crust, ice cream, creamy beverages, and potato chips. Dr. Leachon admitted that “ignorance” is the primary reason or challenge when advising his patients to switch to healthier options or food. “I usually educate them using the Harvard healthy food plate and then give them a food checklist,” he shared. 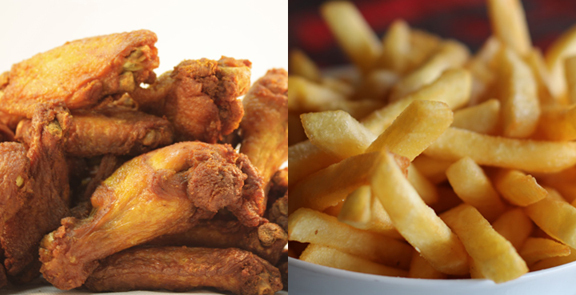 Favorite fast-food fare fried chicken and French fries can be harmful to health. Created by nutrition experts at Harvard School of Public Health and editors at Harvard Health Publications, the Healthy Eating Plate was designed to address deficiencies in the US Department of Agriculture’s MyPlate. It provides detailed guidance, in a simple format, to help people make the best eating choices. In order to totally eliminate trans fats, Dr. Leachon said there is a need for preventive health education and strong regulatory guidelines to all consumers and public health awareness. “Stop smoking and drinking alcohol. Eat healthy food. Exercise regularly. Practice ‘chill’ days to reduce stress. Lose weight and have regular check-ups,” he advised. According to Mary Grace Anne S. Rosales-Sto. Domingo of ImagineLaw, Inc., it is possible to totally ban the use of partially hydrogenated oil (PHO) with appropriate policy and regulatory measures in place. “Countries like the United States, Canada, and Thailand were able to do it. We can learn from their experience and determine the appropriate policy measures for us to implement a PHO ban. It will take a multi-sectoral effort to conduct the necessary research, but it’s achievable,” said Rosales-Sto. Domingo. In October 2018, ImagineLaw, with support from Global Health Advocacy Incubator, began its legal and regulatory review of trans fat reduction measures in the Philippines and encountered interspersed issues concerning the elimination of trans fat—there was the fragmented food safety regulatory system, the impact of a proposed ban on PHOs/TFAs on the market, and the capacity of the government agencies to regulate or implement TFA regulations. “Another challenge would be on the lack of available data on the level of consumption of TFA or the prevalence of the use of PHOs in the Philippines. This is currently the subject of proposed study to be conducted by DOST-FNRI (Department of Science and Technology-Food and Nutrition Research Institute),” she revealed. To raise consumer awareness, Rosales-Sto. Domingo suggested that government agencies like Department of Health and National Nutrition Council disseminate IEC (information, education, and communication) materials and conduct trainings in barangays on the negative effects of industrially-produced TFA to one’s health. “The DepEd, in line with its policy banning the sale of food with TFA in schools, can conduct a simultaneous communication campaign promoting a healthy diet in schools. The Department of Trade and Industry can also conduct IEC campaigns on healthy diets and identify consumer products that pose a threat to consumers’ health. Lastly, the DOH and Food and Drug Authority (FDA) can strengthen guidelines on nutrition labelling and teach consumers how to read nutrition labels and identify ingredients known to have TFA,” she said. But the best agency to lead efforts and facilitate multi-agency coordination would be the DOH said Rosales-Sto. Domingo. To encourage producers to produce healthy oil, she revealed that during their consultations with the Department of Agriculture, possible incentives would be government subsidies in terms of certification and registration fees for farmers, crop insurance, or farm assistance. 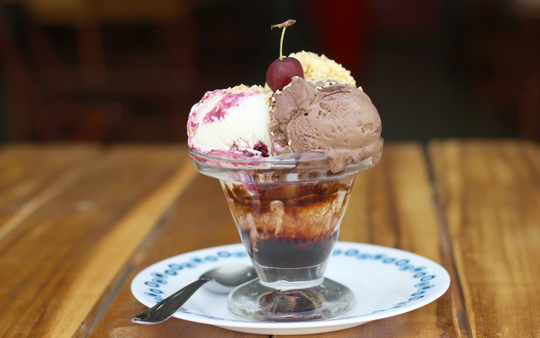 Limit consumption of ice cream and other food items with trans fats. While possible disincentives would include higher taxes on oil or ingredients with trans fat through enactment of appropriate legislation.